Soothing and relaxing. Soothes your mind and body while your muscles and tired limbs relax. 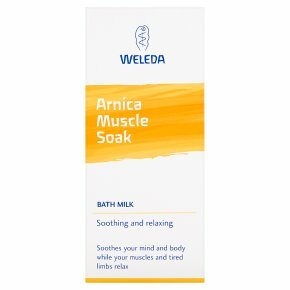 Certified natural body care.Inspired by nature and combining extracts of Arnica flowers and Birch leaves with Rosemary and Lavender essential oils, Weleda Arnica Muscle Soak soothes mind and body during times of over-exertion and weariness. Please read the enclose leaflet before use. Directions: Shake the bottle before use. Pour 2 - 3 capfuls into running water to disperse the bath milk. After bathing, dry gently, cover with soft towel and relax in warm surroundings. Not recommended for children under 3 years of age.<br><br>Discard 3 months after opening.<br><br>FOR EXTERNAL USE ONLY<br><br>Do not use after the expiry date stated.